Mary Lee Pugh Hope was baptized in the Baptist Church as an eleven-year-old girl. She remembered, “I studied the Holy Bible; I would ask the pastor of our Church a few things, one of them was this: Did he think it was right to charge people for preaching the gospel of Jesus Christ to the people?” The pastor, her father’s brother, refused to answer her questions and “made [her] father whip [her]." Such abuse, however, did not change Mary's mind. She had a feeling that something was amiss in the Baptist Church. She prayed “the best” she knew how and continued to live her life as a Baptist. Then, when she was 17, Mary became engaged to Len Hope, a member of the Church of Jesus Christ of Latter-day Saints. At that time, she remembered, “I had not heard anything about the Mormon Church worthwhile, but it happened to be a Mormon boy that I was to marry.” Her uncle questioned her decision to marry “that old Mormon boy,” but she remained committed to Len. Mary wed Len in 1920 and approximately five years later she joined Len in his faith when she converted to the Church of Jesus Christ of Latter-days Saints. She told her uncle that she couldn’t imagine “anything better and I could see no better Church.” Elder William O. Clouse from Virden, Arizona, baptized her on September 15, 1925 and Elder Sterling W. Sill from Layton, Utah, then confirmed her a member of the faith. It was a busy day for the Hope family. The missionaries blessed their three oldest daughters on the same day (Roseanna who was three, Izetta who was two, and Maryzell who was six months old). By 1930 the Hope family, along with tens of thousands of other African Americans, joined in a Great Migration from the American South to the urban North. They settled in Sycamore, outside of Cincinnati, Ohio, where Mary was a housewife and reported to a census worker in 1940 that she had a fourth grade education. In 1935, a notice in the Cincinnati Enquirer indicated that Len and Mary purchased lot 180 in the Lincoln Heights subdivision of Sycamore Township and by 1940 they owned their home, valued at $2,500. Due to racial prejudice, the Hopes did not regularly attend the LDS Cincinnati Branch. According to a white missionary and later bishop of the Hopes, they were not asked to stop attending, but they recognized that they were not welcome to worship with white members unless it was for a special event like a district conference. Consequently, they held their own worship services once a month in their home, and prepared delicacies like ribs and homemade ice cream to share with their worshippers. Despite their maltreatment, the Hopes paid a full tithe. The Hopes moved to Utah in 1947 because of Len’s failing health. 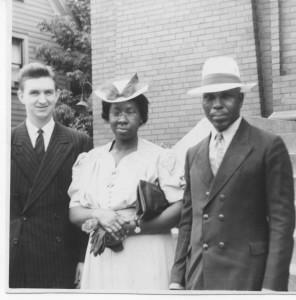 Len and Mary became members of the Mill Creek Stake, in a section of Salt Lake County where many black pioneers had previously lived. There Mary attended Relief Society meetings with white Latter-day Saints in integrated services. Loran Stephenson, Mary’s last bishop in Pennsylvania, fondly recalled listening to Mary bear her testimony in worship service “about the truthfulness of the gospel, [and] the heart-felt way she felt about the Lord Jesus Christ.” Stephenson nonetheless suggested that Len and Mary would have “loved to have been Latter-day Saints in a full sense,” presumably meaning fully welcome in fellowship and able to participate in temple rituals. Towards the end of her life, Mary suffered from health problems and spent considerable time in the University of Pennsylvania Hospital, where her positivity and good cheer were reportedly noted by her doctor. When Mary died in 1973, her funeral was a standard LDS funeral, though her children held a Muslim service for her as well. Bishop Stephenson authorized church funds to have her body flown to Salt Lake City so that she could be laid to rest next to her beloved husband Len in Elysian Burial Gardens in Mill Creek, Utah. Church of Jesus Christ of Latter-day Saints. Record of Members Collection, 375 8, box 34, folder 1, image 264. Church History Library, Salt Lake City, Utah. Church of Jesus Christ of Latter-day Saints. Presiding Bishopric. Stake and mission census, 1914-1935. CR 4 311. “Hope,” 1925, 1930, 1935. Church History Library, Church of Jesus Christ of Latter-day Saints, Salt Lake City, Utah. Hanks, Marion D. Oral history interview. MSS 7752, Charles Redd Center for Western Studies oral history project records; L. Tom Perry Special Collections; Harold B. Lee Library; Brigham Young University; Provo, Utah. United States. 1910 Census. Alabama, Wilcox County, Clifton. United States. Departing Passenger and Crew Lists, 1914-1966. New York, 1948-1956. S.S. Mohamed Ali El Kebir, 30 October 1955. “Testimony of Len R. Hope and Mary Hope, 1938,” 6, MS 2111, Church History Library, Church of Jesus Christ of Latter-day Saints, Salt Lake City, UT. “Testimony of Len R. Hope and Mary Hope, 1938,” 7; Church of Jesus Christ of Latter-day Saints. Record of Members Collection, 375 8, box 34, folder 1, image 264, Church History Library, Salt Lake City, Utah. Marion D. Hanks. Oral history interview, 2, 4, 6, MSS 7752, Charles Redd Center for Western Studies oral history project records, L. Tom Perry Special Collections, Harold B. Lee Library, Brigham Young University, Provo, Utah. United States, Departing Passenger and Crew Lists, 1914-1966, New York, 1948-1956, S.S. Mohamed Ali El Kebir, 30 October 1955; Loran Stephenson, oral interview by Jessie L. Embry, 1989, 3, Charles Redd Center for Western Studies oral history project records, L. Tom Perry Special Collections, Harold B. Lee Library, Brigham Young University, Provo, Utah. Jessie L. Embry, Black Saints in a White Church (Salt Lake City: Signature Books, 1994), 44; Stephenson, oral interview, 5. Embry, Black Saints in a White Church, 47; Stephenson, oral interview, 5; Mary Lee Pugh Hope, FindAGrave.com.